In 2006 Research In Motion was trying to get its Blackberry phone into mainland China. But before they got there, China Unicom Ltd., the state-controlled telecommunications giant, launched something they called the Redberry. RIM sued China Unicom, but from what I can tell, the lawsuit sort of died. China Unicom ranks as China's second-biggest mobile operator and is almost part of the government -- so suing China Unicom would be like suing China. What's particularly amusing about this knock-off is that it hit the Chinese markets before RIM got their phones into China. 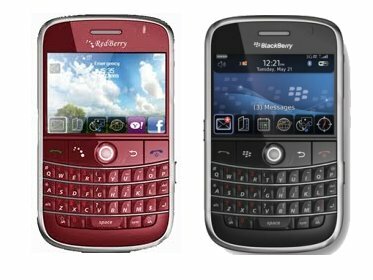 Whoever is manufacturing it had to completely reverse engineer it to get the look and feel of a Blackberry with a red shell. This isn’t a case of some Chinese manufacturer just changing out the color of the phone -- Blackberry’s aren’t even made in China (I know, I thought all phones were made in China, too). So someone in China decided to make a knock-off of an internationally popular phone that wasn’t available domestically and then, along comes the real Blackberry, arriving second to market with their own product. I seriously doubt anyone in China thinks that the Blackberry is a knock off of the Redberry, but it would be the ultimate in Brand Identity Theft if they did -- not just stealing the brand, but taking it over and becoming the brand like some kind of sci-fi horror alien. The closeness of the two makes me wonder about industrial espionage.